"Shostakovich" redirects here. For the conductor and son of Dmitri Shostakovich, see Maxim Shostakovich. This name uses Eastern Slavic naming customs; the patronymic is Dmitriyevich and the family name is Shostakovich. Dmitri Dmitriyevich Shostakovich (Russian: Дми́трий Дми́триевич Шостако́вич (help·info), tr. Dmitriy Dmitrievich Shostakovich, pronounced [ˈdmʲitrʲɪj ˈdmʲitrʲɪjɪvʲɪtɕ ʂəstɐˈkovʲɪtɕ]; 25 September [O.S. 12 September] 1906 – 9 August 1975) was a Russian composer and pianist. He is regarded as one of the major composers of the 20th century. Shostakovich's orchestral works include 15 symphonies and six concerti. His chamber output includes 15 string quartets, a piano quintet, two piano trios, and two pieces for string octet. His solo piano works include two sonatas, an early set of preludes, and a later set of 24 preludes and fugues. Other works include three operas, several song cycles, ballets, and a substantial quantity of film music; especially well known is The Second Waltz, Op. 99, music to the film The First Echelon (1955–1956), as well as the suites of music composed for The Gadfly. Born at Podolskaya street in Saint Petersburg, Russia, Shostakovich was the second of three children of Dmitri Boleslavovich Shostakovich and Sofiya Vasilievna Kokoulina. Shostakovich's paternal grandfather, originally surnamed Szostakowicz, was of Polish Roman Catholic descent (his family roots trace to the region of the town of Vileyka in today's Belarus), but his immediate forebears came from Siberia. A Polish revolutionary in the January Uprising of 1863–4, Bolesław Szostakowicz would be exiled to Narym (near Tomsk) in 1866 in the crackdown that followed Dmitri Karakozov's assassination attempt on Tsar Alexander II. When his term of exile ended, Szostakowicz decided to remain in Siberia. He eventually became a successful banker in Irkutsk and raised a large family. His son Dmitri Boleslavovich Shostakovich, the composer's father, was born in exile in Narim in 1875 and studied physics and mathematics in Saint Petersburg University, graduating in 1899. He then went to work as an engineer under Dmitri Mendeleev at the Bureau of Weights and Measures in Saint Petersburg. In 1903 he married another Siberian transplant to the capital, Sofiya Vasilievna Kokoulina, one of six children born to a Russian Siberian native. Their son, Dmitri Dmitriyevich Shostakovich, displayed significant musical talent after he began piano lessons with his mother at the age of nine. On several occasions he displayed a remarkable ability to remember what his mother had played at the previous lesson, and would get "caught in the act" of playing the previous lesson's music while pretending to read different music placed in front of him. In 1918 he wrote a funeral march in memory of two leaders of the Kadet party, murdered by Bolshevik sailors. In 1919, at the age of 13, he was admitted to the Petrograd Conservatory, then headed by Alexander Glazunov, who monitored Shostakovich's progress closely and promoted him. Shostakovich studied piano with Leonid Nikolayev after a year in the class of Elena Rozanova, composition with Maximilian Steinberg, and counterpoint and fugue with Nikolay Sokolov, with whom he became friends. Shostakovich also attended Alexander Ossovsky's music history classes. Steinberg tried to guide Shostakovich on the path of the great Russian composers, but was disappointed to see him 'wasting' his talent and imitating Igor Stravinsky and Sergei Prokofiev. Shostakovich also suffered for his perceived lack of political zeal, and initially failed his exam in Marxist methodology in 1926. His first major musical achievement was the First Symphony (premiered 1926), written as his graduation piece at the age of 19. This work brought him to the attention of Mikhail Tukhachevsky, who helped Shostakovich find accommodation and work in Moscow, and sent a driver around in "a very stylish automobile" to take him to a concert. After graduation, Shostakovich initially embarked on a dual career as concert pianist and composer, but his dry style of playing was often unappreciated (his American biographer, Laurel Fay, comments on his "emotional restraint" and "riveting rhythmic drive"). He nevertheless won an "honorable mention" at the First International Chopin Piano Competition in Warsaw in 1927. He attributed the disappointment at the competition to suffering from appendicitis and the jury being all-Polish. He had his appendix removed in April 1927. After the competition Shostakovich met the conductor Bruno Walter, who was so impressed by the composer's First Symphony that he conducted it at its Berlin premiere later that year. Leopold Stokowski was equally impressed and gave the work its U.S. premiere the following year in Philadelphia and also made the work's first recording. Shostakovich concentrated on composition thereafter and soon limited his performances primarily to those of his own works. In 1927 he wrote his Second Symphony (subtitled To October), a patriotic piece with a great pro-Soviet choral finale. Owing to its experimental nature, as with the subsequent Third Symphony, it was not critically acclaimed with the enthusiasm given to the First. 1927 also marked the beginning of Shostakovich's relationship with Ivan Sollertinsky, who remained his closest friend until the latter's death in 1944. Sollertinsky introduced the composer to the music of Mahler, which had a strong influence on his music from the Fourth Symphony onwards. While writing the Second Symphony, Shostakovich also began work on his satirical opera The Nose, based on the story by Nikolai Gogol. In June 1929, against the composer's own wishes, the opera was given a concert performance; it was ferociously attacked by the Russian Association of Proletarian Musicians (RAPM). Its stage premiere on 18 January 1930 opened to generally poor reviews and widespread incomprehension among musicians. In the late 1920s and early 1930s, Shostakovich worked at TRAM, a proletarian youth theatre. Although he did little work in this post, it shielded him from ideological attack. Much of this period was spent writing his opera, Lady Macbeth of the Mtsensk District, which was first performed in 1934. It was immediately successful, on both popular and official levels. It was described as "the result of the general success of Socialist construction, of the correct policy of the Party", and as an opera that "could have been written only by a Soviet composer brought up in the best tradition of Soviet culture". Shostakovich married his first wife, Nina Varzar, in 1932. Initial difficulties led to a divorce in 1935, but the couple soon remarried when Nina became pregnant with their first child, Galina. On 17 January 1936, Joseph Stalin paid a rare visit to the opera for a performance of a new work, Quiet Flows the Don, based on the novel by Mikhail Sholokhov, by the little-known composer Ivan Dzerzhinsky, who was called to Stalin's box at the end of the performance and told that his work had "considerable ideological-political value". On 26 January, Stalin revisited the opera, accompanied by Vyacheslav Molotov, Andrei Zhdanov and Anastas Mikoyan, to hear Lady Macbeth of the Mtsensk District. He and his entourage left without speaking to anyone. Shostakovich had been forewarned by a friend that he should postpone a planned concert tour in Arkhangelsk to be present at that performance. Eyewitness accounts testify that Shostakovich was "white as a sheet" when he went to take his bow after the third act. In letters written to Sollertinsky, Shostakovich recounted the horror with which he watched as Stalin shuddered every time the brass and percussion played too loudly. Equally horrifying was the way Stalin and his companions laughed at the love-making scene between Sergei and Katerina. The next day, Shostakovich left for Arkhangelsk, and was there when he heard on 28 January that Pravda had published a tirade titled Muddle Instead of Music, complaining that the opera was a "deliberately dissonant, muddled stream of sounds...(that) quacks, hoots, pants and gasps." This was the signal for a nationwide campaign, during which even Soviet music critics who had praised the opera were forced to recant in print, saying they "failed to detect the shortcomings of Lady Macbeth as pointed out by Pravda". There was resistance from those who admired Shostakovich, including Sollertinsky, who turned up at a composers' meeting in Leningrad called to denounce the opera and praised it instead. Two other speakers supported him. When Shostakovich returned to Leningrad, he had a telephone call from the commander of the Leningrad Military District, who had been asked by Marshal Tukhachevky to make sure that he was all right. When the writer Isaac Babel was under arrest four years later, he told his interrogators that "it was common ground for us to proclaim the genius of the slighted Shostakovich." On 6 February, Shostakovich was again attacked in Pravda, this time for his light comic ballet The Limpid Stream, which was denounced because "it jangles and expresses nothing" and did not give an accurate picture of peasant life on a collective farm. Fearful that he was about to be arrested, Shostakovich secured an appointment with the Chairman of the USSR State Committee on Culture, Platon Kerzhentsev, who reported to Stalin and Molotov that he had instructed the composer to "reject formalist errors and in his art attain something that could be understood by the broad masses", and that Shostakovich had admitted being in the wrong and had asked for a meeting with Stalin, which was not granted. As a result of this campaign, commissions began to fall off, and Shostakovich's income fell by about three-quarters. His Fourth Symphony was due to receive its premiere on 11 December 1936, but he withdraw it from the public, possibly because it was banned, and the symphony was not performed for 25 years, until 30 December 1961. Lady Macbeth of the Mtsensk District was also suppressed. A bowdlerised version was eventually performed under a new title, Katerina Izmailova, on 8 January 1963. The anti-Shostakovich campaign also served as a signal to artists working in other fields, including art, architecture, the theatre and cinema, with the writer Mikhail Bulgakov, the director Sergei Eisenstein, and the theatre director Vsevolod Meyerhold among the prominent targets. More widely, 1936 marked the beginning of the Great Terror, in which many of the composer's friends and relatives were imprisoned or killed. These included Marshal Tukhachevsky (shot months after his arrest); his brother-in-law Vsevolod Frederiks (a distinguished physicist, who was eventually released but died before he got home); his close friend Nikolai Zhilyayev (a musicologist who had taught Tukhachevsky; shot shortly after his arrest); his mother-in-law, the astronomer Sofiya Mikhaylovna Varzar (sent to a camp in Karaganda); his friend the Marxist writer Galina Serebryakova (20 years in camps); his uncle Maxim Kostrykin (died); and his colleagues Boris Kornilov and Adrian Piotrovsky (executed). His only consolation in this period was the birth of his daughter Galina in 1936; his son Maxim was born two years later. The publication of the Pravda editorials coincided with the composition of Shostakovich's Fourth Symphony. The work marked a great shift in style, owing to the substantial influence of Mahler and a number of Western-style elements. The symphony gave Shostakovich compositional trouble, as he attempted to reform his style into a new idiom. The composer was well into the work when the Pravda article appeared. He continued to compose the symphony and planned a premiere at the end of 1936. Rehearsals began that December, but after a number of rehearsals Shostakovich, for reasons still debated today, decided to withdraw the symphony from the public. A number of his friends and colleagues, such as Isaak Glikman, have suggested that it was, in fact, an official ban that Shostakovich was persuaded to present as a voluntary withdrawal. Whatever the case, it seems possible that this action saved the composer's life: during this time Shostakovich feared for himself and his family. Yet he did not repudiate the work; it retained its designation as his Fourth Symphony. A piano reduction was published in 1946, and the work was finally premiered in 1961, well after Stalin's death. During 1936 and 1937, in order to maintain as low a profile as possible between the Fourth and Fifth symphonies, Shostakovich mainly composed film music, a genre favored by Stalin and lacking in dangerous personal expression. The composer's response to his denunciation was the Fifth Symphony of 1937, which was musically more conservative than his earlier works. Premiered on 21 November 1937 in Leningrad, it was a phenomenal success. The Fifth brought many to tears and welling emotions. Later, Shostakovich's purported memoir, Testimony, stated: "I'll never believe that a man who understood nothing could feel the Fifth Symphony. Of course they understood, they understood what was happening around them and they understood what the Fifth was about." The success put Shostakovich in good standing once again. Music critics and the authorities alike, including those who had earlier accused Shostakovich of formalism, claimed that he had learned from his mistakes and become a true Soviet artist. In a newspaper article published under Shostakovich's name, the Fifth Symphony was characterized as "A Soviet artist's creative response to just criticism." The composer Dmitry Kabalevsky, who had been among those who disassociated themselves from Shostakovich when the Pravda article was published, praised the Fifth Symphony and congratulated Shostakovich for "not having given in to the seductive temptations of his previous 'erroneous' ways." It was also at this time that Shostakovich composed the first of his string quartets. His chamber works allowed him to experiment and express ideas that would have been unacceptable in his more public symphonies. In September 1937 he began to teach composition at the Leningrad Conservatory, which provided some financial security but interfered with his creative work. In 1939, before Soviet forces attempted to invade Finland, the Party Secretary of Leningrad Andrei Zhdanov commissioned a celebratory piece from Shostakovich, the Suite on Finnish Themes, to be performed as the marching bands of the Red Army paraded through Helsinki. The Winter War was a bitter experience for the Red Army, the parade never happened, and Shostakovich never laid claim to the authorship of this work. It was not performed until 2001. After the outbreak of war between the Soviet Union and Germany in 1941, Shostakovich initially remained in Leningrad. He tried to enlist for the military but was turned away because of his poor eyesight. To compensate, he became a volunteer for the Leningrad Conservatory's firefighter brigade and delivered a radio broadcast to the Soviet people listen (help·info). The photograph for which he posed was published in newspapers throughout the country. His greatest and most famous wartime contribution was the Seventh Symphony. The composer wrote the first three movements in Leningrad and completed the work in Kuibyshev (now Samara), where he and his family had been evacuated. It remains unclear whether Shostakovich really conceived the idea of the symphony with the siege of Leningrad in mind. It was officially claimed as a representation of the people of Leningrad's brave resistance to the German invaders and an authentic piece of patriotic art at a time when morale needed boosting. The symphony was first premiered by the Bolshoi Theatre orchestra in Kuibyshev and was soon performed abroad in London and the United States. The most compelling performance was the Leningrad premiere by the Radio Orchestra in the besieged city. The orchestra had only 14 musicians left, so the conductor Karl Eliasberg had to recruit anyone who could play an instrument to perform the symphony. The family moved to Moscow in spring 1943. At the time of the Eighth Symphony's premiere, the tide had turned for the Red Army. As a consequence, the public, and most importantly the authorities, wanted another triumphant piece from the composer. Instead, they got the Eighth Symphony, perhaps the ultimate in sombre and violent expression in Shostakovich's output. In order to preserve Shostakovich's image (a vital bridge to the people of the Union and to the West), the government assigned the name "Stalingrad" to the symphony, giving it the appearance of mourning of the dead in the bloody Battle of Stalingrad. But the piece did not escape criticism. Its composer is reported to have said: "When the Eighth was performed, it was openly declared counter-revolutionary and anti-Soviet. They said, 'Why did Shostakovich write an optimistic symphony at the beginning of the war and a tragic one now? At the beginning, we were retreating and now we're attacking, destroying the Fascists. And Shostakovich is acting tragic, that means he's on the side of the fascists.'" The work was unofficially but effectively banned until 1956. The Ninth Symphony (1945), in contrast, was much lighter in tone. Gavriil Popov wrote that it was "splendid in its joie de vivre, gaiety, brilliance, and pungency!! But by 1946 it too was the subject of criticism. Israel Nestyev asked whether it was the right time for "a light and amusing interlude between Shostakovich's significant creations, a temporary rejection of great, serious problems for the sake of playful, filigree-trimmed trifles." The New York World-Telegram of 27 July 1946 was similarly dismissive: "The Russian composer should not have expressed his feelings about the defeat of Nazism in such a childish manner". Shostakovich continued to compose chamber music, notably his Second Piano Trio (Op. 67), dedicated to the memory of Sollertinsky, with a bittersweet, Jewish-themed totentanz finale. In 1947, the composer was made a deputy to the Supreme Soviet of the RSFSR. In 1948, Shostakovich, along with many other composers, was again denounced for formalism in the Zhdanov decree. Andrei Zhdanov, Chairman of the RSFSR Supreme Soviet, accused Shostakovich and other composers (such as Sergei Prokofiev and Aram Khachaturian) of writing inappropriate and formalist music. This was part of an ongoing anti-formalism campaign intended to root out all Western compositional influence as well as any perceived "non-Russian" output. The conference resulted in the publication of the Central Committee's Decree "On V. Muradeli’s opera The Great Friendship," which targeted all Soviet composers and demanded that they write only "proletarian" music, or music for the masses. The accused composers, including Shostakovich, were summoned to make public apologies in front of the committee. Most of Shostakovich's works were banned, and his family had privileges withdrawn. Yuri Lyubimov says that at this time "he waited for his arrest at night out on the landing by the lift, so that at least his family wouldn't be disturbed." The decree's consequences for composers were harsh. Shostakovich was among those dismissed from the Conservatory altogether. For him, the loss of money was perhaps the largest blow. Others still in the Conservatory experienced an atmosphere thick with suspicion. No one wanted his work to be understood as formalist, so many resorted to accusing their colleagues of writing or performing anti-proletarian music. In the next few years, Shostakovich composed three categories of work: film music to pay the rent, official works aimed at securing official rehabilitation, and serious works "for the desk drawer". The latter included the Violin Concerto No. 1 and the song cycle From Jewish Folk Poetry. The cycle was written at a time when the postwar anti-Semitic campaign was already under way, with widespread arrests, including that of I. Dobrushin and Yiditsky, the compilers of the book from which Shostakovich took his texts. The restrictions on Shostakovich's music and living arrangements were eased in 1949, when Stalin decided that the Soviets needed to send artistic representatives to the Cultural and Scientific Congress for World Peace in New York City, and that Shostakovich should be among them. For Shostakovich, it was a humiliating experience culminating in a New York press conference where he was expected to read a prepared speech. Nicolas Nabokov, who was present in the audience, witnessed Shostakovich starting to read "in a nervous and shaky voice" before he had to break off "and the speech was continued in English by a suave radio baritone". Fully aware that Shostakovich was not free to speak his mind, Nabokov publicly asked him whether he supported the then recent denunciation of Stravinsky's music in the Soviet Union. Shostakovich, who was a great admirer of Stravinsky and had been influenced by his music, had no alternative but to answer in the affirmative. Nabokov did not hesitate to write that this demonstrated that Shostakovich was "not a free man, but an obedient tool of his government." Shostakovich never forgave Nabokov for this public humiliation. That same year Shostakovich was obliged to compose the cantata Song of the Forests, which praised Stalin as the "great gardener". Stalin's death in 1953 was the biggest step toward Shostakovich's rehabilitation as a creative artist, which was marked by his Tenth Symphony. It features a number of musical quotations and codes (notably the DSCH and Elmira motifs, Elmira Nazirova being a pianist and composer who had studied under Shostakovich in the year before his dismissal from the Moscow Conservatory), the meaning of which is still debated, while the savage second movement, according to Testimony, is intended as a musical portrait of Stalin. The Tenth ranks alongside the Fifth and Seventh as one of Shostakovich's most popular works. 1953 also saw a stream of premieres of the "desk drawer" works. During the forties and fifties, Shostakovich had close relationships with two of his pupils, Galina Ustvolskaya and Elmira Nazirova. In the background to all this remained Shostakovich's first, open marriage to Nina Varzar until her death in 1954. He taught Ustvolskaya from 1937 to 1947. The nature of their relationship is far from clear: Mstislav Rostropovich described it as "tender". Ustvolskaya rejected a proposal of marriage from him after Nina's death. Shostakovich's daughter, Galina, recalled her father consulting her and Maxim about the possibility of Ustvolskaya becoming their stepmother. Ustvolskaya's friend Viktor Suslin said that she had been "deeply disappointed" in Shostakovich by the time of her graduation in 1947. The relationship with Nazirova seems to have been one-sided, expressed largely through his letters to her, and can be dated to around 1953 to 1956. He married his second wife, Komsomol activist Margarita Kainova, in 1956; the couple proved ill-matched, and divorced three years later. In 1959, Shostakovich appeared on stage in Moscow at the end of a concert performance of his Fifth Symphony, congratulating Leonard Bernstein and the New York Philharmonic Orchestra for their performance (part of a concert tour of the Soviet Union). Later that year, Bernstein and the New York Philharmonic recorded the symphony in Boston for Columbia Records. The year 1960 marked another turning point in Shostakovich's life: he joined the Communist Party. The government wanted to appoint him General Secretary of the Composers' Union, but in order to hold that position he was required to attain Party membership. It was understood that Nikita Khrushchev, the First Secretary of the Communist Party from 1953 to 1964, was looking for support from the leading ranks of the intelligentsia in an effort to create a better relationship with the Soviet Union's artists. This event has been interpreted variously as a show of commitment, a mark of cowardice, the result of political pressure, or his free decision. On the one hand, the apparat was undoubtedly less repressive than it had been before Stalin's death. On the other, his son recalled that the event reduced Shostakovich to tears, and he later told his wife Irina that he had been blackmailed. Lev Lebedinsky has said that the composer was suicidal. From 1962, he served as a delegate in the Supreme Soviet of the USSR. Once he joined the Party, several articles he did not write denouncing individualism in music were published in Pravda under his name. In joining the party, Shostakovich was also committing himself to finally writing the homage to Lenin that he had promised before. His Twelfth Symphony, which portrays the Bolshevik Revolution and was completed in 1961, was dedicated to Vladimir Lenin and called "The Year 1917." Around this time, his health began to deteriorate. Shostakovich's musical response to these personal crises was the Eighth String Quartet, composed in only three days. He subtitled the piece "To the victims of fascism and war", ostensibly in memory of the Dresden fire bombing that took place in 1945. Yet, like the Tenth Symphony, this quartet incorporates quotations from several of his past works and his musical monogram. Shostakovich confessed to his friend Isaak Glikman, "I started thinking that if some day I die, nobody is likely to write a work in memory of me, so I had better write one myself." Several of Shostakovich's colleagues, including Natalya Vovsi-Mikhoels and the cellist Valentin Berlinsky, were also aware of the Eighth Quartet's biographical intent. Peter J. Rabinowitz has also pointed to covert references to Richard Strauss's Metamorphosen in the Eighth Quartet. In 1962 Shostakovich got married for the third time, to Irina Supinskaya. In a letter to Glikman, he wrote "her only defect is that she is 27 years old. In all other respects she is splendid: clever, cheerful, straightforward and very likeable." According to Galina Vishnevskaya, who knew the Shostakoviches well, this marriage was a very happy one: "It was with her that Dmitri Dmitriyevich finally came to know domestic peace... Surely, she prolonged his life by several years." In November he made his only venture into conducting, conducting a couple of his own works in Gorky; otherwise he declined to conduct, citing nerves and ill health. That year saw Shostakovich again turn to the subject of anti-Semitism in his Thirteenth Symphony (subtitled Babi Yar). The symphony sets a number of poems by Yevgeny Yevtushenko, the first of which commemorates a massacre of Ukrainian Jews during the Second World War. Opinions are divided how great a risk this was: the poem had been published in Soviet media, and was not banned, but remained controversial. After the symphony's premiere, Yevtushenko was forced to add a stanza to his poem which said that Russians and Ukrainians had died alongside the Jews at Babi Yar. In 1965 Shostakovich raised his voice in defence of poet Joseph Brodsky, who was sentenced to five years of exile and hard labor. Shostakovich co-signed protests together with Yevtushenko and fellow Soviet artists Kornei Chukovsky, Anna Akhmatova, Samuil Marshak, and the French philosopher Jean-Paul Sartre. After the protests the sentence was commuted, and Brodsky returned to Leningrad. In 1964 Shostakovich composed the music for the Russian film Hamlet, which was favourably reviewed by The New York Times: "But the lack of this aural stimulation – of Shakespeare's eloquent words – is recompensed in some measure by a splendid and stirring musical score by Dmitri Shostakovich. This has great dignity and depth, and at times an appropriate wildness or becoming levity". In later life, Shostakovich suffered from chronic ill health, but he resisted giving up cigarettes and vodka. Beginning in 1958 he suffered from a debilitating condition that particularly affected his right hand, eventually forcing him to give up piano playing; in 1965 it was diagnosed as poliomyelitis. He also suffered heart attacks the following year and again in 1971, and several falls in which he broke both his legs; in 1967 he wrote in a letter: "Target achieved so far: 75% (right leg broken, left leg broken, right hand defective). All I need to do now is wreck the left hand and then 100% of my extremities will be out of order." A preoccupation with his own mortality permeates Shostakovich's later works, among them the later quartets and the Fourteenth Symphony of 1969 (a song cycle based on a number of poems on the theme of death). This piece also finds Shostakovich at his most extreme with musical language, with twelve-tone themes and dense polyphony throughout. He dedicated the piece to his close friend Benjamin Britten, who conducted its Western premiere at the 1970 Aldeburgh Festival. The Fifteenth Symphony of 1971 is, by contrast, melodic and retrospective in nature, quoting Wagner, Rossini and the composer's own Fourth Symphony. Shostakovich died of lung cancer on 9 August 1975. A civic funeral was held; he was interred in Novodevichy Cemetery, Moscow. Even before his death he had been commemorated with the naming of the Shostakovich Peninsula on Alexander Island, Antarctica., Despite suffering from Motor Neurone Disease (or ALS) from as early as the 1960s, Shostakovich insisted upon writing all his own correspondence and music himself, even when his right hand was virtually unusable. This is a last hallmark of his extraordinarily determined and tenacious character. He was survived by his third wife, Irina; his daughter, Galina; and his son, Maxim, a pianist and conductor who was the dedicatee and first performer of some of his father's works. Shostakovich himself left behind several recordings of his own piano works; other noted interpreters of his music include Emil Gilels, Mstislav Rostropovich, Tatiana Nikolayeva, Maria Yudina, David Oistrakh, and members of the Beethoven Quartet. His last work was his Viola Sonata, which was first performed on 28 December 1975, four months after his death. Shostakovich's musical influence on later composers outside the former Soviet Union has been relatively slight, although Alfred Schnittke took up his eclecticism and his contrasts between the dynamic and the static, and some of André Previn's music shows clear links to Shostakovich's style of orchestration. His influence can also be seen in some Nordic composers, such as Lars-Erik Larsson. Many of his Russian contemporaries, and his pupils at the Leningrad Conservatory were strongly influenced by his style (including German Okunev, Boris Tishchenko, whose 5th Symphony of 1978 is dedicated to Shostakovich's memory, Sergei Slonimsky, and others). Shostakovich's conservative idiom has grown increasingly popular with audiences both within and beyond Russia, as the avant-garde has declined in influence and debate about his political views has developed. For a complete list of Shostakovich's compositions, see List of compositions by Dmitri Shostakovich. For a thematical selection of works by Shostakovich, see Category:Compositions by Dmitri Shostakovich. Shostakovich's works are broadly tonal and in the Romantic tradition, but with elements of atonality and chromaticism. In some of his later works (e.g., the Twelfth Quartet), he made use of tone rows. His output is dominated by his cycles of symphonies and string quartets, each totaling fifteen works. The symphonies are distributed fairly evenly throughout his career, while the quartets are concentrated towards the latter part. Among the most popular are the Fifth and Seventh Symphonies and the Eighth and Fifteenth Quartets. Other works include the operas Lady Macbeth of Mtsensk, The Nose and the unfinished The Gamblers based on the comedy of Nikolai Gogol; six concertos (two each for piano, violin and cello); two piano trios; and a large quantity of film music. Many commentators have noted the disjunction between the experimental works before the 1936 denunciation and the more conservative ones that followed; the composer told Flora Litvinova, "without 'Party guidance' ... I would have displayed more brilliance, used more sarcasm, I could have revealed my ideas openly instead of having to resort to camouflage." Articles published by Shostakovich in 1934 and 1935 cited Berg, Schoenberg, Krenek, Hindemith, "and especially Stravinsky" among his influences. Key works of the earlier period are the First Symphony, which combined the academicism of the conservatory with his progressive inclinations; The Nose ("The most uncompromisingly modernist of all his stage-works"); Lady Macbeth, which precipitated the denunciation; and the Fourth Symphony, described in Grove's Dictionary as "a colossal synthesis of Shostakovich's musical development to date". The Fourth Symphony was also the first in which the influence of Mahler came to the fore, prefiguring the route Shostakovich took to secure his rehabilitation, while he himself admitted that the preceding two were his least successful. 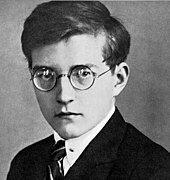 Even before the Stalinist anti-Semitic campaigns in the late 1940s and early 1950s, Shostakovich showed an interest in Jewish themes. He was intrigued by Jewish music’s "ability to build a jolly melody on sad intonations". Examples of works that included Jewish themes are the Fourth String Quartet (1949), the First Violin Concerto (1948), and the Four Monologues on Pushkin Poems (1952), as well as the Piano Trio in E minor (1944). He was further inspired to write with Jewish themes when he examined Moisei Beregovski’s thesis on Jewish folk music in 1946. In 1948, Shostakovich acquired a book of Jewish folk songs, and from this he composed the song cycle From Jewish Folk Poetry. He initially wrote eight songs that were meant to represent the hardships of being Jewish in the Soviet Union. To disguise this, Shostakovich added three more songs meant to demonstrate the great life Jews had under the Soviet regime. Despite his efforts to hide the real meaning in the work, the Union of Composers refused to approve his music in 1949 under the pressure of the anti-Semitism that gripped the country. From Jewish Folk Poetry could not be performed until after Stalin's death in March 1953, along with all the other works that were forbidden. Throughout his compositions, Shostakovich demonstrated a controlled use of musical quotation. This stylistic choice has been common in previous composers, but Shostakovich developed it into a defining characteristic of his music. Rather than quoting other composers, Shostakovich preferred to quote himself. His compositions have been connected by musicologists through their quotations. One example is the main theme of Katerina's aria, Seryozha, khoroshiy moy from the fourth act of Lady Macbeth of the Mtsensk District. It accompanies Katerina as she reunites with her lover Sergei. The aria's beauty comes as a breath of fresh air in the intense, overbearing tone of the scene. This goes well with the dialogue, as Katerina visits her lover in prison. The theme is made tragic when Sergei betrays her and finds a new lover upon blaming Katerina for his incarceration. More than 25 years later, Shostakovich quotes this theme in his eighth string quartet. In the midst of this quartet's oppressive and somber themes, the only time the listener receives a light and cheerful moment is when the cello introduces the Seryozha theme about three minutes into the fourth movement. The quotation uses Katerina's hope amid misery as a means to demonstrate the hope of those oppressed by fascists. This theme emerges once again in his 14th string quartet. As in the eighth, the cello introduces the theme, but for an entirely different purpose. The last in Shostakovich's "quartet of quartets", the fourteenth serves to honor the cellist of the Beethoven String Quartet, Sergei Shirinsky. Rather than reflecting the original theme's intentions, the quotation serves as a dedication to Shirinsky. In 2004, the musicologist Olga Digonskaya discovered a trove of Shostakovich manuscripts at the Glinka State Central Museum of Musical Culture, Moscow. In a cardboard file were some "300 pages of musical sketches, pieces and scores" in Shostakovich's hand. "A composer friend bribed Shostakovich's housemaid to regularly deliver the contents of Shostakovich's office waste bin to him, instead of taking it to the garbage. Some of those cast-offs eventually found their way into the Glinka. ... The Glinka archive 'contained a huge number of pieces and compositions which were completely unknown or could be traced quite indirectly,' Digonskaya said." Among these were Shostakovich's piano and vocal sketches for a prologue to an opera, Orango (1932). They were orchestrated by the British composer Gerard McBurney and premiered in December 2011 by the Los Angeles Philharmonic. According to McBurney, opinion is divided on whether Shostakovich's music is "of visionary power and originality, as some maintain, or, as others think, derivative, trashy, empty and second-hand". William Walton, his British contemporary, described him as "the greatest composer of the 20th century". Musicologist David Fanning concludes in Grove's Dictionary that, "Amid the conflicting pressures of official requirements, the mass suffering of his fellow countrymen, and his personal ideals of humanitarian and public service, he succeeded in forging a musical language of colossal emotional power." Some modern composers have been critical. Pierre Boulez dismissed Shostakovich's music as "the second, or even third pressing of Mahler". The Romanian composer and Webern disciple Philip Gershkovich called Shostakovich "a hack in a trance". A related complaint is that Shostakovich's style is vulgar and strident: Stravinsky wrote of Lady Macbeth: "brutally hammering ... and monotonous". English composer and musicologist Robin Holloway described his music as "battleship-grey in melody and harmony, factory-functional in structure; in content all rhetoric and coercion." Shostakovich is in many ways a polar counter-force for Stravinsky. [...] When I have said that the 7th symphony of Shostakovich is a dull and unpleasant composition, people have responded: "Yes, yes, but think of the background of that symphony." Such an attitude does no good to anyone. Salonen has since performed and recorded several of Shostakovich's works, including the Piano Concertos Nos. 1 and 2 (1999), the Violin Concerto No. 1 (2010), the Prologue to "Orango" and the Symphony No. 4 (2012). It is certainly true that Shostakovich borrows extensively from the material and styles both of earlier composers and of popular music; the vulgarity of "low" music is a notable influence on this "greatest of eclectics". McBurney traces this to the avant-garde artistic circles of the early Soviet period in which Shostakovich moved early in his career, and argues that these borrowings were a deliberate technique to allow him to create "patterns of contrast, repetition, exaggeration" that gave his music large-scale structure. Shostakovich was in many ways an obsessive man: according to his daughter he was "obsessed with cleanliness". He synchronised the clocks in his apartment and regularly sent cards to himself to test how well the postal service was working. Elizabeth Wilson's Shostakovich: A Life Remembered (1994 edition) indexes 26 references to his nervousness. Mikhail Druskin remembers that even as a young man the composer was "fragile and nervously agile". Yuri Lyubimov comments, "The fact that he was more vulnerable and receptive than other people was no doubt an important feature of his genius." In later life, Krzysztof Meyer recalled, "his face was a bag of tics and grimaces." In his lighter moods, sport was one of his main recreations, although he preferred spectating or umpiring to participating (he was a qualified football referee). His favourite football club was Zenit Leningrad (now Zenit Saint Petersburg), which he would watch regularly. He also enjoyed playing card games, particularly patience. He was fond of satirical writers such as Gogol, Chekhov and Mikhail Zoshchenko. The influence of the latter in particular is evident in his letters, which include wry parodies of Soviet officialese. Zoshchenko himself noted the contradictions in the composer's character: "he is ... frail, fragile, withdrawn, an infinitely direct, pure child ... [but he is also] hard, acid, extremely intelligent, strong perhaps, despotic and not altogether good-natured (although cerebrally good-natured)." He was diffident by nature: Flora Litvinova has said he was "completely incapable of saying 'No' to anybody." This meant he was easily persuaded to sign official statements, including a denunciation of Andrei Sakharov in 1973. His widow later told Helsingin Sanomat that his name was included without his permission. On the other hand he was willing to try to help constituents in his capacities as chairman of the Composers' Union and Deputy to the Supreme Soviet. Oleg Prokofiev commented that "he tried to help so many people that ... less and less attention was paid to his pleas." When asked if he believed in God, Shostakovich said "No, and I am very sorry about it." Shostakovich represented himself in some works with the DSCH motif, consisting of D-E♭-C-B. Shostakovich's response to official criticism and whether he used music as a kind of covert dissidence is a matter of dispute. He outwardly conformed to government policies and positions, reading speeches and putting his name to articles expressing the government line. But it is evident he disliked many aspects of the regime, as confirmed by his family, his letters to Isaak Glikman, and the satirical cantata "Rayok", which ridiculed the "anti-formalist" campaign and was kept hidden until after his death. He was a close friend of Marshal of the Soviet Union Mikhail Tukhachevsky, who was executed in 1937 during the Great Purge. It is also uncertain to what extent Shostakovich expressed his opposition to the state in his music. The revisionist view was put forth by Solomon Volkov in the 1979 book Testimony, which claimed to be Shostakovich's memoirs dictated to Volkov. The book alleged that many of the composer's works contained coded anti-government messages, placing Shostakovich in a tradition of Russian artists outwitting censorship that goes back at least to Alexander Pushkin. He incorporated many quotations and motifs in his work, most notably his musical signature DSCH. His longtime collaborator Yevgeny Mravinsky said, "Shostakovich very often explained his intentions with very specific images and connotations." The revisionist perspective has subsequently been supported by his children, Maxim and Galina, although Maxim said in 1981 that Volkov's book was not his father's work. Volkov has further argued, both in Testimony and in Shostakovich and Stalin, that Shostakovich adopted the role of the yurodivy or holy fool in his relations with the government. Other prominent revisionists are Ian MacDonald, whose book The New Shostakovich put forward further revisionist interpretations of his music, and Elizabeth Wilson, whose Shostakovich: A Life Remembered provides testimony from many of the composer's acquaintances. Musicians and scholars including Laurel Fay and Richard Taruskin contest the authenticity and debate the significance of Testimony, alleging that Volkov compiled it from a combination of recycled articles, gossip, and possibly some information directly from the composer. Fay documents these allegations in her 2002 article 'Volkov's Testimony reconsidered', showing that the only pages of the original Testimony manuscript that Shostakovich had signed and verified are word-for-word reproductions of earlier interviews he gave, none of which are controversial. Against this, Allan B. Ho and Dmitry Feofanov have pointed out that at least two of the signed pages contain controversial material: for instance, "on the first page of chapter 3, where [Shostakovich] notes that the plaque that reads 'In this house lived [Vsevolod] Meyerhold' should also say 'And in this house his wife was brutally murdered'." In May 1958, during a visit to Paris, Shostakovich recorded his two piano concertos with André Cluytens, as well as some short piano works. These were issued by EMI on an LP, reissued by Seraphim Records on LP, and eventually digitally remastered and released on CD. Shostakovich recorded the two concertos in stereo in Moscow for Melodiya. Shostakovich also played the piano solos in recordings of the Cello Sonata, Op. 40 with cellist Daniil Shafran and also with Mstislav Rostropovich; the Violin Sonata, Op. 134, with violinist David Oistrakh; and the Piano Trio, Op. 67 with violinist David Oistrakh and cellist Miloš Sádlo. There is also a short sound film of Shostakovich as soloist in a 1930s concert performance of the closing moments of his first piano concerto. A colour film of Shostakovich supervising one of his operas, from his last year, was also made. A major achievement was EMI's recording of the original, unexpurgated opera Lady Macbeth of Mtsensk. There was at least one recording of the cleaned-up version, Katerina Ismailova, that Shostakovich had made to satisfy Soviet censorship. But when conductor Mstislav Rostropovich and his wife, soprano Galina Vishnevskaya were finally allowed to emigrate to the West, the composer begged them to record the full original score, which they did in 1979. It features Vishnevskaya as Katerina, Nicolai Gedda as Sergei, Dimiter Petkov as Boris Ismailov and a brilliant supporting cast under Rostropovich's direction. The Noise of Time - a novel concerning Shostakovich by English author Julian Barnes. ^ Fay,Laurel; Fanning,David. "Shostakovich, Dmitry". Grove Music Online. Oxford University Press. Retrieved 30 April 2014. ^ Fay (2000), p. 7. ^ a b Wilson (2006), p. 4. ^ McSmith, Andy (2015). Fear and the Muse Kept Watch, the Russian Masters - from Akhmativa and Pasternak to Shostakoviich and Eisenstein - under Stalin. New York: New Press. p. 171. ISBN 978-1-62097-079-9. ^ The New Grove (2001). ^ Shostakovich/Grigoryev & Platek (1981), p. 33. ^ McSmith, Andy. Fear and the Muse Kept Watch. p. 172. ^ Classical Music (8 March 2004). "When opera was a matter of life or death". London: Telegraph. Retrieved 7 November 2011. ^ Wilson (2006b), pp. 128–9. ^ Fay, Laurel. Shostakovich. pp. 84–85. ^ McSmith, Andy. Fear and the Muse Kept Watch. pp. 175–176. ^ McSmith, Andy. Fear and the Muse Kept Watch. pp. 174–5. ^ Shostakovich/Volkov (1979), p. 59. ^ Volkov (2004), p. 150. ^ Shostakovich/Volkov (2000), p. 135. ^ Taruskin (2009), p. 304. ^ Wilson (2006), p. 152. ^ Edwards (2006), p. 98. ^ Wilson (2006), p. 171. ^ Blokker (1979), p. 31. ^ Wilson (2006), p. 203. ^ Fay (2000): p. 147. ^ Fay (2000): p. 152. ^ a b Hulme 2010, p. xxiv. ^ Shostakovich/Volkov (2004), p. 86. ^ Blokker (1979), pp. 33-4. ^ Wilson (2006), p. 241. ^ Wilson (2006), p. 269. ^ Nabokov (1951), p. 204. ^ Nabokov (1951), p. 205. ^ Wilson (2006), p. 274. ^ Wilson (2006), p. 304. ^ Fay (2000), p. 194. ^ Fay (2000), p. 194; Wilson (2006), p. 297. ^ "1980 Summer Olympics Official Report from the Organizing Committee, vol. 2". p. 283. Archived from the original (PDF) on 22 June 2006. ^ Wilson (1994), pp. 373–80. ^ Ho & Feofanov (1998), p. 390. ^ Manashir Yakubov, Programme notes for the 1998 Shostakovich seasons at the Barbican, London). ^ Hulme 2010, p. xxvii. ^ MacDonald (2006), p. 247. ^ Wilson (2006), p. 263. ^ Wilson (2006), p. 281. ^ Rabinowitz, Peter J. (May 2007). "The Rhetoric of Reference; or, Shostakovich's Ghost Quartet". Narrative. 15 (2): 239–256. doi:10.1353/nar.2007.0013. JSTOR 30219253. Retrieved 5 December 2017. ^ Shostakovich/Glikman (2001), p. 102. ^ Vishnevskaya (1985), p. 274. ^ Wilson (2006), pp. 426–7. ^ Crowther, Bosley, in New York Times, 15 September 1964. ^ Shostakovich/Glikman (2001), p. 147. ^ "Dmitri Shostakovich Dead at 68 After Hospitalization in Moscow". The New York Times. 11 August 1975. ISSN 0362-4331. Retrieved 9 February 2019. ^ The New Grove (2001), pp. 288, 290. ^ Shostakovich/Glikman (2001), p. 181. ^ Wilson (1994), pp. 375–7. ^ The New Grove (2001), p. 289. ^ The New Grove (2001), p. 290. ^ Shostakovich/Glikman (2001), p. 315. ^ See also The New Grove (2001), p. 294. ^ The New Grove (2001), p. 300. ^ Wilson (1994), p. 268. ^ Wilson (1994), pp. 267–9. ^ Harris, Stephen (9 April 2016). "Quartet No. 8". Shostakovich: The String Quartets. Retrieved 18 February 2018. ^ Harris, Stephen (24 August 2015). "Quartet No. 14". Shostakovich: The String Quartets. Retrieved 18 February 2018. ^ a b Loiko, Sergei L.; Johnson, Reed (27 November 2011). "Shostakovich's 'Orango' found, finished, set for Disney Hall". Los Angeles Times. Retrieved 17 February 2012. ^ Ayala, Ted (7 December 2011). "No Monkey Business with LAPO's World Premiere of Shostakovich's 'Orango'". Crescenta Valley Weekly. Retrieved 10 April 2012. ^ Sirén, Vesa (6 April 2009). "Šostakovitšin apinaooppera löytyi" [The ape opera by Shostakovich was found]. Helsingin Sanomat (in Finnish). Helsinki: Sanoma Oy. pp. C1. Archived from the original on 8 April 2009. Retrieved 6 April 2009. ^ "Unknown Shostakovich Opera Discovered". Artsjournal. 21 March 2009. Archived from the original on 3 September 2009. Retrieved 5 April 2009 – via Le Devoir. ^ McBurney (2002), p. 283. ^ British Composers in Interview by R Murray Schafer (Faber 1960). ^ The New Grove (2001), p. 280. ^ McBurney (2002), p. 288. ^ McBurney (2002), p. 290. ^ McBurney (2002), p. 286. ^ Holloway, Robin (26 August 2000). "Shostakovich horrors". The Spectator: 41. Retrieved 29 June 2015. ^ McBurney (2002), p. 295. ^ Wilson (1994), pp. 41–5. ^ Mentioned in his personal correspondence (Shostakovich, tr. Phillips (2001)), as well as other sources. ^ Quoted in Fay (2000), p. 121. ^ a b c Fay (2000), p. 263. ^ Wilson (1994), p. 40. ^ Wilson (2006), pp. 369–70. ^ Wilson (2006), p. 336. ^ This appears in several of his works, including the Pushkin Monologues, Symphony No. 10, and String Quartets Nos 5, 8 & 11. ^ "Shostakovich's son says moves against artists led to defection". The New York Times. New York. 14 May 1981. Retrieved 31 March 2017. Asked about the authenticity of a book published in the West after his father's death, and described as his memoirs, Mr. Shostakovich replied: These are not my father's memoirs. This is a book by Solomon Volkov. Mr. Volkov should reveal how the book was written. Mr. Shostakovich said language in the book attributed to his father, as well as several contradictions and inaccuracies, led him to doubt the book's authenticity. ^ Ho & Feofanov (1998), p. 211. ^ "Dmitri Shostakovich filmed in 1975 during rehearsals". YouTube. 9 January 2008. Retrieved 7 November 2011. ^ a b Hulme 2010, p. xxvi. ^ a b Hulme 2010, p. xxix. ^ Hulme 2010, p. xxii. ^ a b Hulme 2010, p. xxv. ^ Hulme 2010, pp. xxiii–xxv. ^ Hulme 2010, p. xxviii. Ardov, Michael (2004). Memories of Shostakovich. Short Books. ISBN 978-1-904095-64-4. Blokker, Roy (1979). The Music of Dmitri Shostakovich, the Symphonies. The great composers. Associated Univ Press. ISBN 978-083861948-3. Fairclough, Pauline; Fanning, David, eds. (November 2008). The Cambridge Companion to Shostakovich. Cambridge Companions to Music (1st ed.). Cambridge University Press. ISBN 9780521603157. Fanning, David; Fay, Laurel (2001). "Dmitri Shostakovich". In Sadie, Stanley; Tyrrell, John (eds.). The New Grove Dictionary of Music and Musicians (2nd ed.). Macmillan. Fay, Laurel (2000). Shostakovich: A Life. Oxford University Press. ISBN 978-0-19-513438-4. Fay, Laurel (2002). "Volkov's Testimony Reconsidered". In Hamrick Brown, Malcolm (ed.). A Shostakovich Casebook. Indiana University Press. pp. 22–66. ISBN 978-0-253-21823-0. Haas, David. "Shostakovich's Eighth: C minor Symphony against the Grain". In Bartlett, Rosamund (ed.). Shostakovich in Context. Ho, Allan; Feofanov, Dmitry (1998). Shostakovich Reconsidered. Toccata Press. ISBN 978-0-907689-56-0. Hulme, Derek C. (2010) . Dmitri Shostakovich Catalogue: The First Hundred Years and Beyond (4th ed.). Lanham, Maryland: Scarecrow Press. ISBN 978-0-8108-7264-6. Kovnatskaya, Liudmila, ed. (1996). D. D. Shostakovich: Collections to the 90th anniversary. St Petersburg: Kompozitor. Kovnatskaya, Liudmila, ed. (2000). D. D. Shostakovich: Between the moment and Eternity. Documents. Articles. Publications. St Petersburg: Kompozitor. MacDonald, Ian (2006) . The New Shostakovich. Pimlico. ISBN 978-184595064-4. MacDonald, Ian. "Shostakovichiana". Music Under Soviet Rule. Retrieved 17 August 2005. McBurney, Gerard (2002). "Whose Shostakovich?". In Hamrick Brown, Malcolm (ed.). A Shostakovich Casebook. Indiana University Press. ISBN 978-0-253-21823-0.
van Rijen, Onno. "Opus by Shostakovich". Shostakovich & Other Soviet Composers. Archived from the original on 5 September 2005. Retrieved 17 August 2005. Sheinberg, Esti (29 December 2000). Irony, satire, parody and the grotesque in the music of Shostakovich. UK: Ashgate. p. 378. ISBN 978-0-7546-0226-2. Shostakovich, Dmitri (1981). Shostakovich: About Himself and His Times. Compiled by L. Grigoryev and Y.. Platek. Translated by Angus and Neilian Roxburgh. Moscow: Progress Publishers. - (1st ed.). Faber and Faber. 1979. ISBN 978-0-571-11829-8. - (7th ed.). Proscenium. 2000. ISBN 978-0-87910-021-6. - (25th ed.). Hal Leonard. 2004. ISBN 978-161774771-7. Shostakovich, Dmitri; Glikman, Isaak (2001). Story of a Friendship: The Letters of Dmitry Shostakovich to Isaak Glikman. Translated by Phillips, Anthony. Cornell University Press. ISBN 978-0-8014-3979-7. Vishnevskaya, Galina (1985). Galina, A Russian Story. Translated by Guy Daniels (1st ed.). Harcourt Brace Jovanovich. ISBN 978-0156343206. Volkov, Solomon (2004). Shostakovich and Stalin: The Extraordinary Relationship Between the Great Composer and the Brutal Dictator. Knopf. ISBN 978-0-375-41082-6. - (1st ed.). Princeton University Press. 1994. ISBN 978-069102971-9. - (2nd ed.). Faber and Faber. 2006. ISBN 978-057122050-2. - (2nd ed.). Princeton University Press. 2006b. ISBN 978-0691128863. - (2nd ed. - Kindle) Faber and Faber. 2010. ISBN 978-057126115-4. Wikimedia Commons has media related to Dmitri Shostakovich. "Discovering Shostakovich". BBC Radio 3. Paterson, Harry (21 December 2000). "Shostakovich: Revolutionary life, revolutionary legacy". Weekly Worker. Archived from the original on 8 June 2011. Retrieved 31 August 2011. "Shostakovich's Tenth Symphony: The Azerbaijani Link – Elmira Nazirova" by Aida Huseinova, in Azerbaijan International, Vol. 11:1 (Spring 2003), pp. 54–59. Ho, Allan B.; Feofanov, Dmitry (2011). "The Shostakovich Wars" (PDF). Southern Illinois University – Edwardsville. Retrieved 31 August 2011.